Puerto Viejo is an awesome, laidback, Caribbean, Euro-backpacker, Rasta-surfer town on the south Caribbean coast of Costa Rica. This tiny little town offers up an amazing variety of international culinary flavors as well as a wide variety of experiences to choose from. You can surf the world famous Salsa Brava, relax in the natural rock tide pools at the edge of the ocean, party the night away downtown, or unwind in a secluded jungle bungalow. Local Tip: bring cash. Most of the businesses do not accept credit or debit cards, and the line at the ATM is always excruciatingly long. You cannot fly directly to Puerto Viejo by plane. You can, however, book an expensive private charter flight (such as Carmon Air) to Limon and then take a shuttle to Puerto Viejo. You can also take the less expensive Nature Air to Bocas del Toro in Panama, spend the night, and then cross back over the border to Puerto Viejo, Costa Rica. These options are slightly complicated and expensive. It’s not worth flying unless your budget is unlimited and you can have someone arrange these plans for you. The Costa Rican bus system will take you to Puerto Viejo from San Jose for about $8. The buses depart from the Caribe Sur bus station in San Jose every 4 hours starting at 6am and running until 4pm. The bus makes a 20-minute pit stop in Limon for a bathroom and snack break. 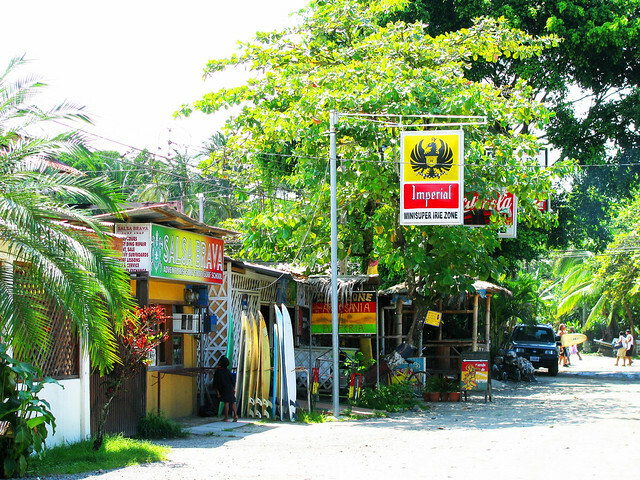 Puerto Viejo is the 3rd stop – the bus goes to Limon, Cahuita, Puerto Viejo, Bribri, and finally Sixaola (the border of Costa Rica and Panama). There are two Puerto Viejos. You want to purchase your ticket to Puerto Viejo de Talamanca from Transportes Mepe, the ticket office at the end of the terminal. Try to buy your tickets early (a day early will suffice) because they assign seats and if there aren’t any left, you will be stuck standing for the 5 hour bus ride. Private or semi-private shuttles are a popular option for families or large groups who can pay extra for hassle-free transportation. Rates are fixed, so you don’t have to negotiate, and they will take you door to door. Plus most of the drivers are also trained in tourism and like to share details about Costa Rica while you are going from point A to point B. Some of the Pacuare River rafting tours include transportation to Puerto Viejo from Arenal or San Jose (or vice versa) in the cost of the rafting trip (~$100). You don’t actually arrive to your destination in a raft, though. First, you go on the rafting trip while your stuff is safely locked away at the rafting headquarters. Then, after the rafting trip, you pick your stuff up and they drive you to your destination in a shuttle. Puerto Viejo is a small town and you can walk everywhere. There aren’t very many police in Puerto Viejo, so you are responsible for your own safety. Be careful walking around, especially at night, don’t carry large sums of money with you, and don’t flash any valuables. This is a popular option and there are bike rental stores all throughout town. Many hotels also rent out bikes, too. Bikes are rented out by the day and cost about $6 per day. Make sure to lock your bike up when you park it! Puerto Viejo is too small for a local bus system. However, if you are interested in exploring the nearby beach towns, you can take a bus from Puerto Viejo to Cahuita, Hone Creek, Cocles, Playa Chiquita, Punta Uva and Manzanillo. The majority of taxis in Puerto Viejo are not metered. Because of this, it is important to negotiate a fee upfront. If you don’t spot one right away, have your hotel or a local business call one for you. Rocking J’s – Located slightly outside of downtown on the beach, Rocking J’s offers private rooms, dorms, tents, and hammocks for sleeping options although sleeping might not be an option at this hostel. This is where you stay if you want to party. Every inch of the place is decorated with tile mosaics and there is a Mexican restaurant and bar inside. Hammocks start at $7 a night. Pagalu Hostel – located at the intersection of Calle 213 and Avenida 69, this downtown hostel has a reputation for being friendly, clean and quiet. They don’t take reservations, so it’s best to show up early in the day to reserve your bed. Rooms start at $10 a night. Finca Chica – located down the road in Playa Cocles, Finca Chica has relaxing secluded jungle cabins for rent. Fall asleep to the sounds of a tropical paradise starting at $45 a night. An alternative to staying in a hostel or hotel is to rent a house for 2 or more nights. There are several available in the area for decent rates. My favorite site to check for this type of accommodation is vrbo.com. If you are planning to stay in Puerto Viejo for a few weeks to a few months, you will want to look for short term housing such as a room or studio apartment. Check websites such as airbnb.com, craigslist.com, or local forums to search for short term housing options. Couchsurfing in Puerto Viejo is an option although there aren’t many open couches due to the tiny size of the town. Might be better utilized as a tool to make friends. Surf – The best time to surf the world famous Salsa Brava is between December and March. There are also good beginner spots in the area for those with less experience. Sun and Swim – From the black sands of Playa Negra to the white sands of Playa Cocles to the natural rock tide pools downtown, Puerto Viejo has enough variety of beaches to satisfy anyone! Shop – Some of the finest artists in Costa Rica sell their jewelry from the stands along the beach at night. You can purchase jewelry that is hand made from local shells and seeds or buy a mola from Panama. There are also several boutiques in town selling custom designed clothing and crafts. 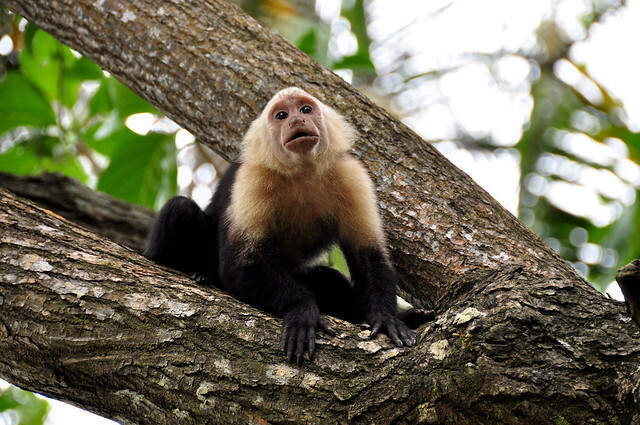 Visit an animal sanctuary – The Jaguar Rescue Center is close to downtown Puerto Viejo and gives you the opportunity to meet and play with rescued howler monkeys, pizotes, sloths, snakes, and more. The sloth sanctuary, Aviarios, is about a 40-minute drive from Puerto Viejo, but well worth the trip. They have a ton of baby sloths and adult sloths that they are rehabilitating for release into the wild. It’s very educational, too. Both locations use all the profits to help the animals. Snorkel and Hike Cahuita National Park – A short taxi or bus ride down the road to the neighboring town of Cahuita will put you at the entrance of one of Costa Rica’s numerous national parks. Hike through the park where lush jungle vegetation and palm trees dip into the ocean while white-faced monkeys and iguanas dance around the path around you. Rent some snorkel gear from the tourist info shop in town to explore beneath the water. The shop can also arrange for a boat to take you out to the reefs to snorkel with a rainbow collection of fish and sharks. Be extra careful in Cahuita because the crime has been steadily increasing in recent years. Sea turtles in Manzanillo – Sea turtle nesting season in Manzanillo is from March to May. You can sign up to go watch them lay eggs at night (this is done respectfully in small groups and out of sight of the turtles). Or you can get more involved and volunteer with an organization that helps protect them by setting up night watches for poachers, identifying and recording turtle trails, finding turtle nests, relocating eggs, and aiding baby turtles in their return to the ocean. The ticos on the Caribbean coast prepare food differently from the rest of Costa Rica by cooking with coconut milk, curry, and ginger. In addition to Caribbean-style food, you can find a wealth of international fusion flavors in Puerto Viejo. Rice and Beans – rice and beans cooked with coconut milk and spices is the perfect accompaniment to Caribbean Chicken. Ron Dom – sopa de mariscos (seafood soup) prepared with coconut milk. Pan Bom – dry chocolate bread cake. Patí – spicy beef empanadas. Stashu’s Con-Fusion – located 200 meters south of downtown, this is the former Loco Natural. The dishes are incredibly creative, delectable, and healthy. At Stashu’s, you get a party in your mouth and you walk away feeling great with energy from the healthy food. It’s amazing. And the plates are only $10 – $15. Flip Flop – Opposite Santa Barbara Fereteria in the center of downtown, this restaurant specializes in a variety of tasty international dishes. My absolute fave is the curry. Bread and Chocolate – located in the center of downtown, they are all natural and grow most of the ingredients themselves. This is a great place for breakfast or brunch. Hanging out downtown – You don’t actually have to go to any particular bar to have a good time in Puerto Viejo. Grab a few beers from a pulperia (convenient store) and hang out on the streets downtown, people watching or making new friends. Just be careful for your safety and don’t carry large sums of money on you. Mango Sunset – located in the heart of downtown by the bus station and on the beach, Mango Sunset is the place to hear live music while dancing or sipping on tasty cocktails. The bar offers live music every Wednesday, Thursday and Sunday with a variety of bands playing Reggae, Rock, Latin Jazz, or Salsa. Koki Beach – Relatively new to town, Koki Beach stands out with its stylish contemporary décor crafted from locally contracted artisans and repurposed items. This is a good spot to sit and people watch, to have nice conversations, or to relax with a cocktail while listening to electronic music. They also serve a variety of Latin fusion food for lunch and dinner, but the prices here are higher than other restaurants in Puerto Viejo. Johnny’s Place – located nearby the police station and on the beach, Johnny’s is where the party ends every night. 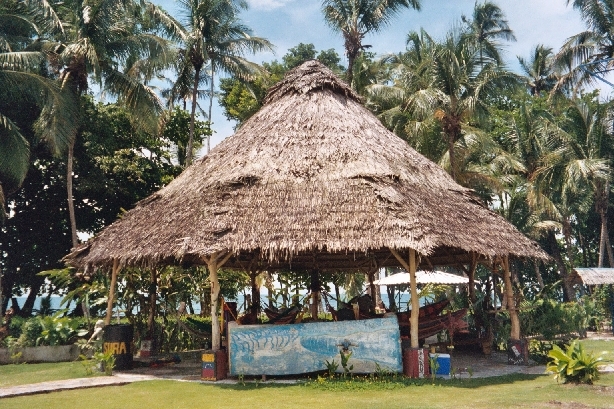 Relatively small bar with dance floor and tables outside on the beach, Johnny’s plays reggae, roots, dub, and house music. Wednesday is ladies night and only women are allowed into the bar until midnight and they are treated to free drinks. It’s a funny sight to see Johnny’s raise the roll-up walls after midnight to let all the drooling guys inside.